Yup - toilets are on the end of the main grandstand just below the K1 symbol. Theres a accessible WC there for a quick change into your leathers. According to Google Maps drive through of the Place...we are well on our own inbetween a seated Stand area overlooking the Pit lane and a Main Concessionaire building, Stopwatch Hospitality Suite.........The place is a little bigger than their nicely laid out map appears to show it.....long walks to see the whole place....looking forward to it though....everythings concentrated around the North Part of the Circuit...Our location Directly Overlooks the Start/Finish Line....must be making respectful atonement of Bimota World championship Winning Days (Day)…..
tis a good location - in the morning you can turn left and view the displays - back for lunch and toilet break then off to the right. Splits the day up nicely. We hope you're looking forward to Festival Italia at Brands Hatch this Sunday (19 August). To help you make the most of your trip to the circuit, here is some useful information about this event. Public admission to the circuit is from 9am. 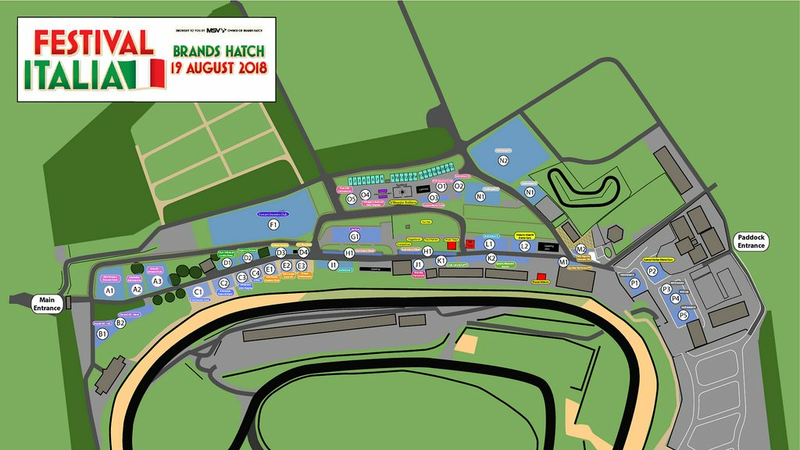 Southbank (inside the venue opposite the rear of the pits) is available for car parking for £5 per car. Click here for more details and to download a pass. Adult tickets are £25 on the gate with FREE entry for under-13s. For more information, please call 0843 453 9000. Grandstand seating is available to purchase from the Megastore opposite the Kentagon restaurant. The Paddock Hill Grandstand and Pit Straight Grandstand are both are priced at £10 for adults and £5 for under 16s. Official souvenir programmes are available from vendors across the venue and the Megastore for £5. Each programme features in-depth articles on the event along with entry lists and information on the racing timetable. There is a free-of-charge grid walk at lunch time on Sunday ahead of the headline Pirelli Ferrari Formula Classic Race at 14:20. Please queue at the Paddock Hill Gate in good time ahead of this to take part. Last admission to the Grid Walk is at 14:45. Click here to download a map for this weekend's event. More "Monster" than "Superlight" eh?